A great deal of emphasis is placed on building the self-esteem of the students at Elliot Primary School and that’s why, every day, they pay compliments to one student. The idea is that the other students all compliment one student, who is chosen at random, to make them feel celebrated, wanted and encouraged. It is just one of the many techniques employed by teachers at the school through the PATHS Programme, run by PRIDE Bermuda, which is celebrating its 30th year of operating. To celebrate its milestone Jerry Moe, National Director of Children’s Programmes at the Hazeldon Betty Ford Center, will lead a series of workshops called ‘Addiction Through the Eyes of a Child’ in Bermuda on May 15 and 16. 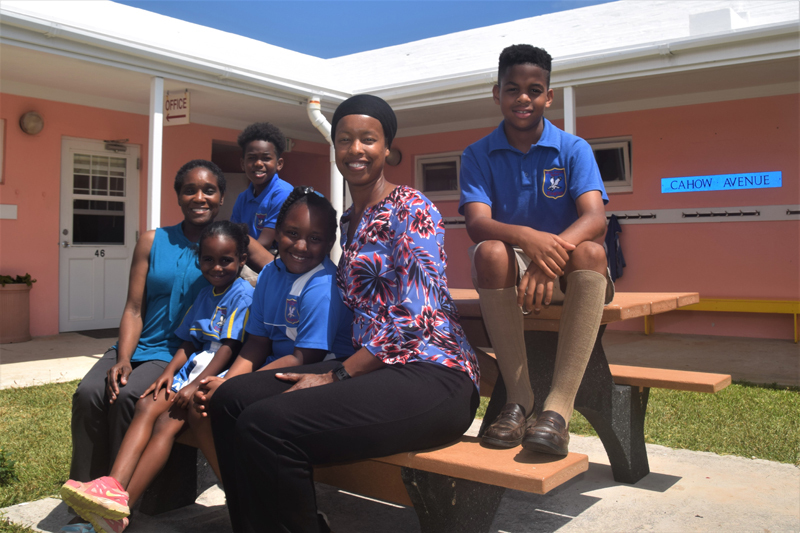 Teacher Makese Gilbert said the school adopted the charity’s PATHS initiative four years ago to teach children how to identify their feelings and visualize them so people could understand how they feel and the children could manage their own feelings. She added: “I went to Chicago to see the PATHS Programme and it was an amazing experience. It set the fire in me and I saw how important it was for my students. PATHS is one of the many programmes run by PRIDE which was originally founded as a parent organization. Today it has expanded its services to include substance abuse prevention programmes and services for students from primary school through to high school. Since it was founded, PRIDE, whose mission statement is ‘To Prevent the Use and Abuse of Alcohol, Tobacco and Other Drugs [ATOD] Amongst Our Youth’, has helped more than 13,000 young people in Bermuda. PRIDE has introduced many programmes, it has been showcased overseas and has won many awards. In 1999 at the 22nd Annual PRIDE International Drug Prevention Conference, PRIDE Bermuda was awarded the PRIDE International Award for its efforts in drug prevention. The Sabbath School Department of Hamilton Seventh Day Adventist Church awarded the organization for Outstanding Service. At the 2003 PRIDE International Conference the PRIDE Bermuda Youth received first place for Drama and Fourth place for an original Public Service Announcement. In 2006 the organization became accredited by the Council on Accreditation. In 2013 the PRIDE Programme Director, Truell Landy, was awarded The Substance Abuse Prevention Professional of the Year Award by the Bermuda Addictions Certification Board and The Department for National Drug Control. Members of PRIDE have also travelled the world promoting the work of the charity: PRIDE Bermuda Youth was selected to staff the Youth to Youth International Conference in Rhode Island as well as the PRIDE World Drug Conference. In 2008 members of the Youth to Youth Team attended the PRIDE World Drug Conference and presented a workshop entitled ‘MONSTER10’ highlighting underage drinking. The workshop received excellent reviews. In 2009 the Youth to Youth Performance Team also presented a very moving drama about the effects of drugs on the family, entitled ‘The Lady’. They wowed hundreds of people throughout Bermuda and the PRIDE World Drug Conference in Louisville, Kentucky. There have also been some significant milestones in terms of training and courses offered and in 1998 PRIDE implemented its continuum of youth programmes involving 18 schools and 120 members and in 2005, six schools implemented the PRIDE Pals Programme in their Primary 6-year curriculum. In 2009 PRIDE Bermuda, in collaboration with Caron Bermuda [now Pathways Bermuda], launched the first phase of implementing a Student Assistance Programme [SAP]. A pilot of the LifeSkills Training Middle Programme, one of the SAP prevention programmes, was launched at Whitney Institute Middle School and in 2012 the three-year pilot was completed, where the results deemed the programme a success in improving student knowledge, and skills. Other programmes include the High School LifeSkills, which is aimed at helping students cope with the challenges of high school. The Parent Programme is designed to help parents strengthen communication with their children and prevent them using substances. And Promoting Alternative Thinking Strategies [PATHS] gives students emotional and social competencies to help reduces aggression and behaviour problems in primary school-aged children while at the same time enhancing the educational process in the classroom. At Elliot, the scheme has proved a hit with the pupils who have clearly absorbed its messages. One of the key parts of the PATHS Programme is the use of ‘Turtle’ which teaches the children to stop, breathe and state the problem as a way of taking ownership of their feelings. Elliot teacher Donyale Eversley has just started teaching the PATHS programme and is using it to problem solve. “They are interacting with each other, learning how they feel and what they want others to do because of the way they feel. It has been very open,” said Mrs Eversley. Judith Burgess, PRIDE’s Executive Director, said: “I think the most empowering thing we do is facilitating the concept that we have options. “I’d like to think that when people think of PRIDE they associate us with words like persistent, excellent, determined, hopeful, research guided, solution oriented, passionate.